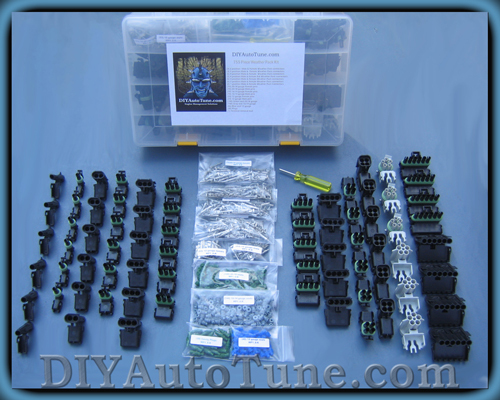 Probably going to just order an assortment kit of Delphi Weatherpack connectors. I did a lot of the crimp/heatshrink stuff on the Xtra Cab and it just never came out as nice as I would like. A weatherpack kit is a very marginal added cost in comparison to how many crimped connectors I fubar'd and had to replace in the past. Thats a good idea. I agree that wire nuts have absolutely no place on a vehicle. I've spent a small fortune on shrink wrap, crimp connectors, electrical tape and other wiring crap and have never been completely happy with how any of it looks. It holds up fine, but its tough to make it clean. Thats my thing too. I usually would start out each wiring project saying I would take my time and make it look clean, then get pissed halfway though because of the ugly crimped connections and electrical tape and begin taking the "good enough" approach just to get it on the trailer and go wheelin. Thanks dood! I'll let ya know when I get around to doing the wiring stuff. Picked up some wheel cylinders, new brake shoes and a rebuild kit for the drums. Hoping to dig into them a little this weekend and see if this solves the low pedal issue. This is totally normal, right? Got all that junk cleaned out and rebuilt. The truck definitely stops better now, but I still have some air in the lines. I keep getting bubbles at the drivers rear only so once I'm back from this next work trip I'm going to try a pressure bleeder and see if I can get that junk out of there. 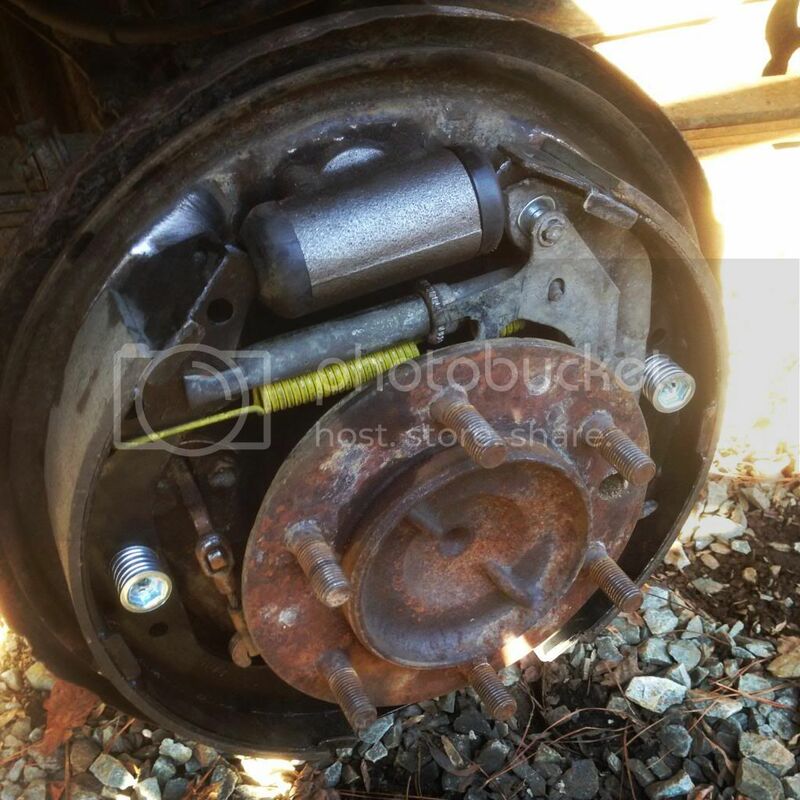 Robbie also has a full set of front rotors, calipers, pads and wheel hubs off his brothers old truck that only have a few hundred miles on them. So those will go on in a few weeks once I get the time to mess with it. air out. sometimes it can be a b*tch. Yeah man! Robbie and I opened the drums up and just stopped to stare. I have seen what mud does, but that was probably the worst. Notice the mangled backing plates. I am half tempted to cut them off but know it will introduce more junk into the drum again as time goes on. I need to go in and re-adjust the drums now that I have driven it the last few days. I am starting to think that when I did it initially I mistook the noise from the backing plate being corroded and rubbing for the slight drag I was looking for during the initial adjustment. Yay rust. That did it. Adjusted the drums and did another bleed. Pedal feels right and it stops a LOT better now. 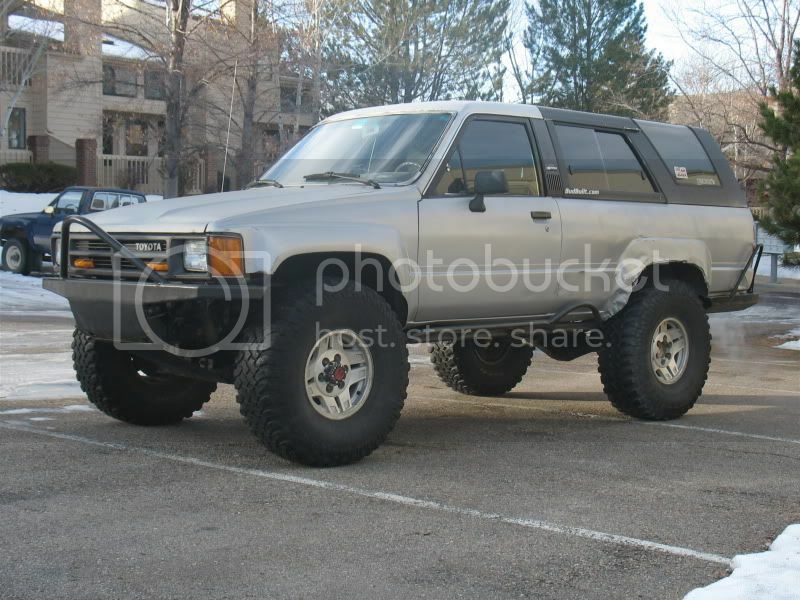 it's a trail rig fool. You're good to go. Yep that is what trees are for! That face... HORSEPOWER! HORSEPOWER! OOOOOOOOOOOOO! 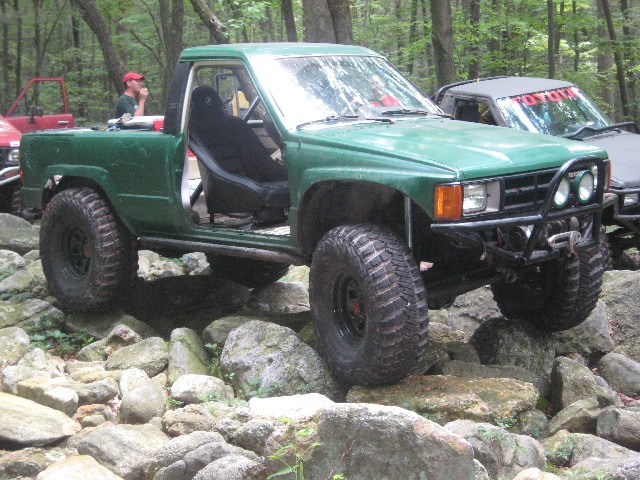 This is really because I don't feel like going back through pages and pages of sh&%t on Pirate for me to find pictures of low slung 4Runners so I am linking stuff here. My rear springs are completely flat and sitting on the overloads so I am running through ideas of what to do as a replacement without having to put any money into the IFS. 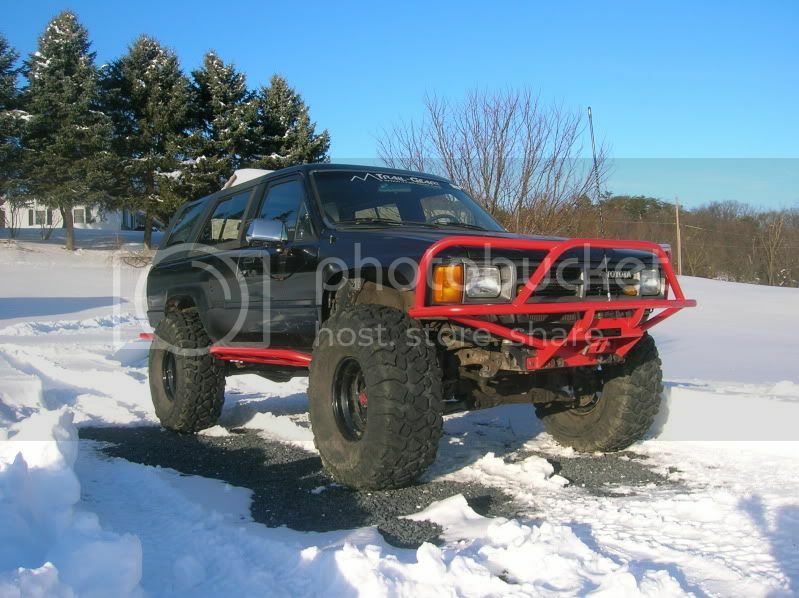 I planned on cutting the rust out of the fenders anyway so more than likely I'll just cut them, put a decent set of stock rear leafs back in with a shackle in the back and some balljoint spacers in the front. 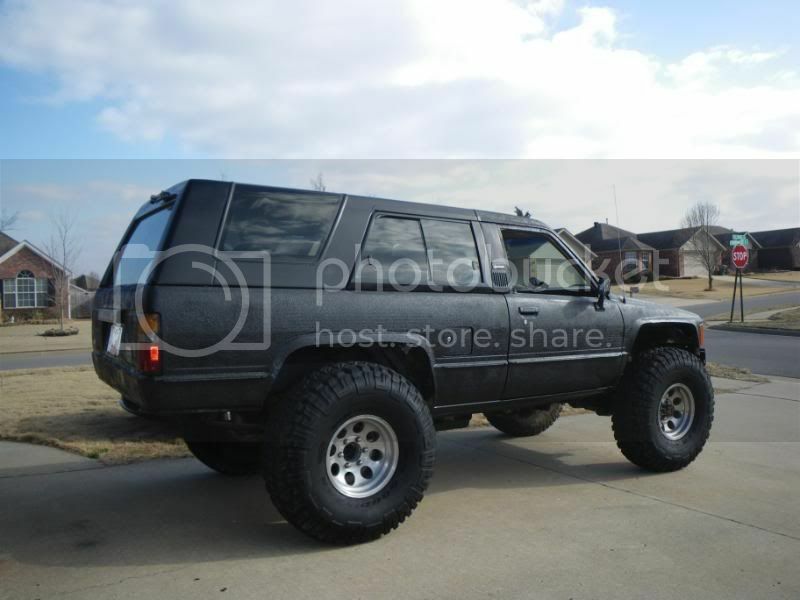 37's No lift solid axle pushed forward 2"
35's and no idea about the rest. 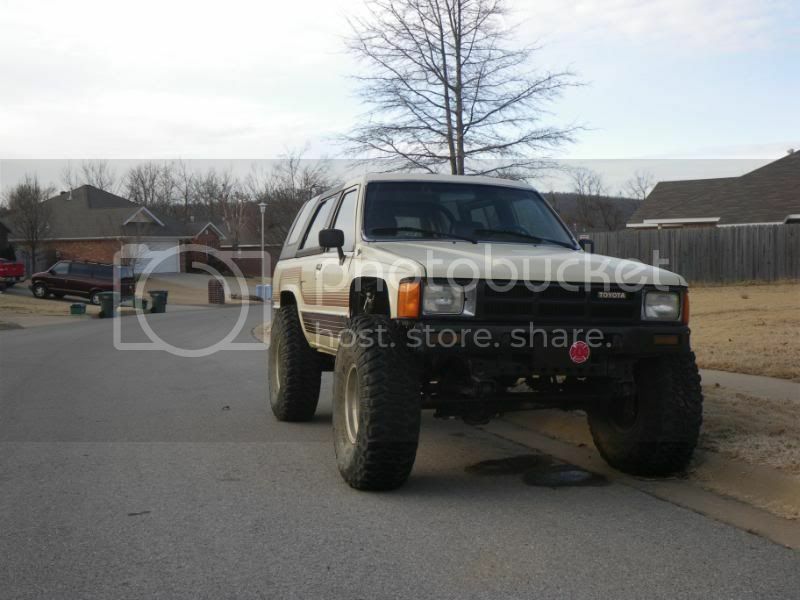 I just like the bumper. F150 rear springs turned around! Just FYI, if you cut the outer fenders (rear) more than an inch or two, you'll get into the inner fender and will need to seal it up some how otherwise your cargo area will turn into a mud pit from the tires slinging crap into the fenders. That is what I have been eying. LKQ near me has a few F150's I might go check out after I get back from my next trip. That is what I have noticed. It shouldn't be too hard to "tub" the fenders back there. I have been looking at a bunch and the two methods seem to either be to cut the fender out and build a tub out of sheet metal or cut a little less off the outer fender and bend it underneath and tack that into place and fiberglass it in. I'm not sold on either. tractor supply mini tub for the win. Same idea, except use one for a double axle trailer since they are usually 40-66" in length and just section out what I don't need. It beats shaping all of that out of sheet metal.